The Quiz Maker plugin allows you to create and answer key and automatically score quizzes. These online quizzes are great for online courses, teachers who would like to go paperless, and more. In your WordPress admin, go to 'Formidable' → 'Add-Ons' and click the 'Install' button for the WordPress Quiz Maker plugin. First, create a form the same way as other Formidable forms. Drag and drop in the fields you need and add any options you would like. To make a multiple choice quiz, include dropdown or radio fields in the quiz form. Add a 'Quiz Score' field into your form. This field is listed on the form builder page at the bottom of the sidebar with the regular field types. Save the form. If you would like the quiz taker to see their score immediately after submission, include the shortcode for the 'Quiz Score' field in the form success message. See the options below to display the quiz score. Click on 'Entries' in the top nav, and then the 'Add new' button. Add an entry to your quiz form with all the correct answers. The quiz field will appear in your form, so you can check the box to set it as the answer key. If there is already an answer key set, the quiz field will not appear in the form. If you're not sure which entry is set as the answer key, it can also be found on the Settings page for this form. 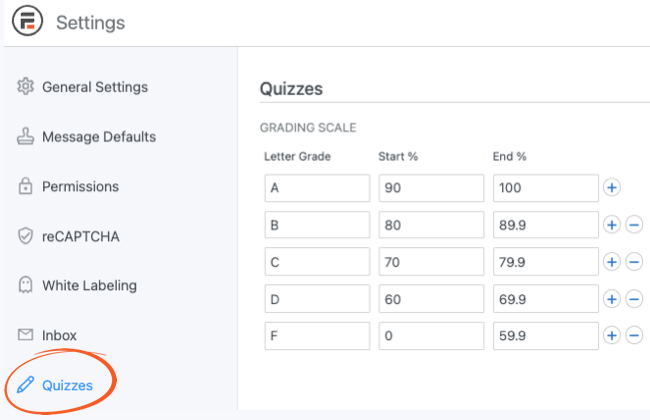 Your quiz form is now ready to start collecting and automatically grading quizzes. When a quiz is created or updated, the score will be saved in the Quiz Score field in that entry. By default, the quiz score is displayed as the fraction of correct answers. The formatting options are listed below. In these examples, replace 'x' with the ID or field key of the Quiz Score field in the form. You can use these examples in a View, Email Notification, success message, or other Formidable contexts where field shortcodes work. The default grading scale includes only letter grades (A, B, C, D, and F). To customize this scale, go to the Formidable → Global Settings → Quizzes page. Any numbers that are not covered by the scale settings will not show a letter grade when the score is displayed.